Thanks to advances in science and medicine, our parents are living longer than ever before. But our health-care system doesn't perform as well when decline eventually sets in. We want to do our best as our loved ones face new complications--more diseases and disabilities--demanding further need for support and careful judgment, but the choices we have to make can seem overwhelming. Family doctor and geriatrician Dennis McCullough recommends a new approach: Slow Medicine. 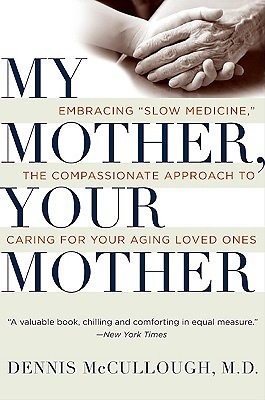 Shaped by common sense and kindness, it advocates for careful anticipatory "attending" to an elder's changing needs rather than waiting for crises that force acute medical interventions--thereby improving the quality of elders' extended late lives without bankrupting their families financially or emotionally. This is not a plan for preparing for death; it is a plan for understanding, for caring, and for helping those you love live well during their final years.